AMMONNEWS - Field Medicine Director Brig.Gen. Salem Zawahreh said that 114 displaced Syrians, who required medical attention, have been admitted to public hospitals in Jordan, bringing the total number of cases rushed to hospitals since the start of fighting in southern Syria to 114. 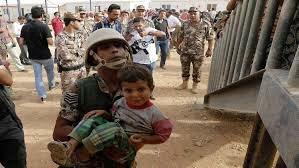 The Jordanian Royal Medical Services offered treatment to 233 cases so far Friday and then returned to Syrian territory, except for 11 cases which were admitted into Jordanian public hospitals, as their condition was relatively more difficult, Zawahreh told Petra. He pointed out that medical attention was provided to 1,460 displaced Syrians since the outbreak of battles in the south of the neighboring country. Zawahreh said "light injuries are medicated on the Jordanian-Syrian border and then returned to Syrian territory."